Inspired by the many years of devotional chanting that went along with the territory of spending time at Sivananda ashrams around the world, Miriam Zernis found a new way to express herself through kirtan (musical prayer). It is with great joy and humility that she now shares it publically. 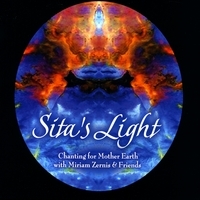 Sita's Light was recorded on November 2nd, 2007 as a labor of love for her teachers, and dedicated to Swami Vishnudevananda. During his lifetime, Swamiji worked tirelessly for the cause of peace in the world and the propagation of the yogic teachings. He also delighted in kirtan as did his guru, Swami Sivananda. Kudos for a "First Timer"
Miriam Zernis has been practicing yoga since 1994 and is an internationally certified Sivananda Yoga Acharya (Master) having completed her advanced training in southern India. She continues to explore everything yoga has to offer and is currently studying Raja Yoga and Vedanta in an everlasting quest to be challenged both physically, mentally and most of all, spiritually. Miriam is a 6th generation Reiki Master Teacher of the Usui System of Natural Healing, as well as a Karuna Reiki® Master, and a graduate of the Institute for Integrative Nutrition. In early 2006, after 21 years as a news writer and Senior Editor at ABC News, she resigned from her position to fully dedicate herself to yoga, Reiki and holistic health counseling. She teaches yoga as a tool for healing and as a pathway for Truth.